Sunderland Harrier Kevin Jeffress recorded the same time as the winner but was given second place in the Temple Park 5k at South Shields. The Seaham man clocked 15.39 with Thames Valley Harrier Michael Cameron declared the winner. Adrian Bailes (Birtley) was third in 15.57, Houghton Harrier Lee Dover took fourth (16.33) and Sunderland Stroller Mark Anderson finished fifth (16.33). Other Sunderland times and positions were: 8th Paul Blakey (16.41), 10th Paul Robson (Wearside Triathlon) (17.10), 12th Ian Ritchie (17.28), 14th Jamie Collin (Stroller) (17.31), and 31st Paul MacLachlan (19.16). The women’s race was won by Danielle Smythe (Heaton Harriers) in 18.01 and she was followed by Mairi Clancy (Tyne Bridge) with 18.57 and Chloe Price (Birtley) was third ( 19.02). 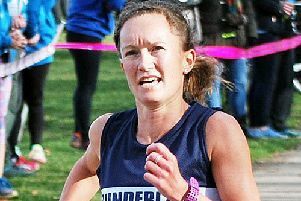 Sunderland Harrier Alice Smith clocked 19.21 and Stroller Wendy Chapman stopped the clock on 19.37 for fourth and fifth places respectively. In the North East Grand Prix at Monkton, Middlesborugh and Cleveland athlete Greg Jayasuriya won the 1500m (3.55.68) after a battle with Under-17 Houghton Harrier Will Bellamy who was second in (3.58.34). Adrian Bailes was third (4.00.53) and Morpeth’s Sam Hancox finished fourth (4.00.81). In the other graded races, Sunderland Harrier Under-17 Cameron Lawton won his first ever race with a big PB (4.45.19) and clubmate Under-15 Dillon Ravell was second in his event with a grade four standard (4.40.10). Houghton’s Under-15 Chris Coulson, in fourth, also gained a grade four standard with his 4.46.19 clocking. Other Houghton Harriers to gain a 1500m standard were Under-17s Courtney Clark 4.48.91 and Lydia James 4.47.62, who both gained grade three standards.